Mark Skullerud - New Paintings "Seattle Re-Cline"
We are pleased to offer the new works by Northwest artist, Mark Skullerud for the month of May as we exhibit "Seattle Re-Cline". This year Skullerud brings us new, sharp and crisp, stylized paintings of some of Seattle's known and lesser known urban scenes. Skullerud's new and mature urban landscapes draw heavily upon his power as a trained illustrator while balancing his interest in abstraction. We can see where cubism makes a subtle appearance as a tool to establish his version of the overall concept that could be termed as "objective correlative"
With a Cubist style and evocative colors, Skullerud depicts our contemporary and pedestrian lives with bridges, boats, parks, buildings and urban streets. He doesn't romanticize the subject, but rather breaks it down to an objective correlative that allows the expression of an emotion to be translated through events, objects and color palette depicted. The visual narrative of his paintings are really very well done. On the flip side, Skullerud has additional works that fall far more closely in line with abstraction. Using a method he describes as undirected drawing, he creates unexpected compositions that rely on our innate tendency to find order in chaos. As with his more representaional work, each piece begins with a graphite composition leading to one or more small color studies and finishing with an oil painting. He wants viewers to know the beauty that’s visible every day, and to recognize the fleeting and subtle light that is gives the region its character and identity. The geography of Seattle and the Puget Sound are all about hills, valleys, rivers and waterways. He sees mountains and urban hills as a performance stage for lighting. They are sculptural like muscles, 3D forms that serve to show off the cloud shadows and sun, the filtered light that changes from moment to moment with the seasons. They are, from a distance, textural. As cloud shadows slip up and over peaks, the textures take on new vibrancy or subtlety that shows in the small color changes washed and rewashed by distance and atmosphere. He sees a never ending movie that makes this part of the world a place worth living in. As with our past exhibits with Skullerud, the selection of artwork is diverse and there is really something for everyone. Small acrylic studies on canvas and the original concept drawings done in graphite are also available as support works to the larger completed paintings. Be sure to check our website or get on our mailing list for special “Wednesday Night”Meet the Artist Receptions and other Special Events that are on a little more personal level. It is a great time…come on out! People used to get excited to go to a gallery, meet an artist in person and experience a work of art. Now, with almost every image an artist makes available on the internet, more people can view the work online and decide if they like it enough to leave their house to visit the gallery, or attend the opening reception, or just stay in to watch another night of reality television. I guess there is also the flip side: maybe the artist sees marketing the work to a critical mass over the web beneficial to their career. Or maybe it’s the collector who would like to see the work online first to get a sense of what they might want to acquire. What’s really driving this art market — artists, collectors, galleries? We’ll save the answer to that question for another post. Artists and dealers know that art must be experienced in person to truly get a sense of its magnitude — it’s the outsiders who don’t get that. This is another benefit of visiting an art gallery. Viewing artwork on the Internet is like walking by a gallery on a rainy night and wiping the fog from the glass to get a peek. You think you can see the art but there is a barrier obscuring your vision — distance from the actual art piece can distort your perception, and not being able to see how a work of art hangs or is displayed next to or near other works of art — that can be an issue too. We’d hate for you to finally take delivery of your newest conversation piece just to find out it doesn’t fit where you wanted it, or the color clashes too much with your chartreuse drapes. Most art is non-refundable. Galleries are one such place to build a community — a real, true social network — your art ecosystem, and that is important. It’s been this way forever. Warm body introductions are important. Social networks on the internet are okay to rack up followers or friends, but a great quote that I read in the book The Start-Up of You by Reid Hoffman, the founder of LinkedIn states, “There is a big difference between being the most connected person and being the best connected person.” My network came from the schools that I attended, but also through the artists, collectors, patrons, mentors, educators, curators and publishers that I bumped into at gallery openings and other art-related events along the way. Now that I am an art dealer, I don’t get out to openings like I did in the past. When I happened to go to a recent First Friday’s gallery event in Boston, it was great to run into old friends. It reminded me of what I love about the arts and I will stress it here again: the community. Fact: There is definitely a different experience meeting someone in person, rather than just looking at their photograph on a website. Just ask the thousands who think they have found their soul mate on sites like Match.com, and then realize they look nothing like their picture when they finally meet up for a date. The same goes true for looking at and experiencing a piece of art in a gallery. Before you click that ‘buy’ button on one of those online websites that sell art, go visit and support your local art galleries and experience what can happen. You may just be surprised at what you see, whom you meet, and what you will learn. Congratulations to Jaime Ellsworth for her inclusion into "100 Artists of the Northwest" by E. Ashely Rooney. E. Ashley Rooney, of Lexington, Massachusetts, has written several art books; this is her fifth in the "100 Artists" series. She has established a solid reputation for her architectural, design, and historical works. My mother always said “see you in the funny papers” and alas, she finally saw me there. 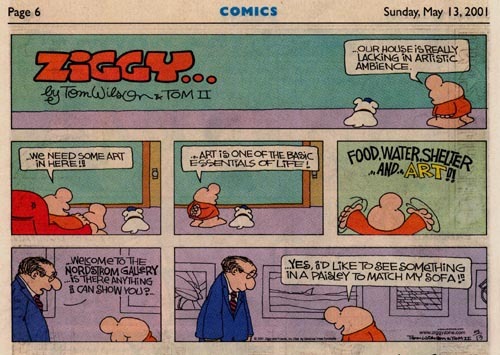 On Mother’s Day May 13, 2001, The Gunnar Nordstrom Gallery appeared nationally in a wonderful 3 panel Sunday edition of the comic strip Ziggy by Tom Wilson. In the title panel, Ziggy is looking up at his home’s blank walls with his dog, exclaiming “Our house is lacking artistic ambience” In the next panel, Ziggy says “… We need some art in here” “…art is one of the essentials of life!” “FOOD, WATER, SHELTER and ART” he exclaims with arms waving. The third panel has a very distinguished art dealer standing in a gallery talking to Ziggy “…Welcome to the Gunnar Nordstrom Gallery…is there anything I can show you?” Ziggy answers “…yes, I’d like to see something in a paisley to match my sofa! !” The very distinguished art dealer only sighs and of course finds Ziggy exactly what he was looking for. We are never too stuffy to help you find exactly what you are looking for. Ziggy has a new book out as of November 2003, Ziggy Goes Hollywood features many of his most recent successful comic strips....and yes....we made the cut. Read the Gallery comic on page 114. Wouldn't that make a great gift? Many thanks for that great plug to our friend Tom Wilson and Tom II for their support and great comic strip. Yes, “Matisse” the mistress of the gallery has been sold and is off to a new home in Southern California. Those of you that know Gunnar and his love for sailing will agree that it was a sad day to see Matisse leave her slip at Moss Bay. Matisse was a lovely 1968 30’ Shields daysailer that had been a welcome addition to the gallery and it’s clients for many years. Easily the prettiest boat on the lake, she was sailed often and she is going to be missed. She is going to join her own kind in a fleet of other Shields at Orange Coast College and The University of California at Irvine and will be well taken care of. Happy sailing Matisse! Vernissage is the newest addition to the Gallery's collection of beautiful women. As was Matisse, Vernissage is also a vintage 1968 daysailer, but a Soling. Designed in Norway for use in the Olympics as a One Design racing boat between 1972 and 2000, the Soling is light and fast, but not nearly as comfortable as the Shields was. Vernissage is a demanding boat and makes you work for a sail, but she still fashions herself quite sporty while maintaining the status of one of the prettiest boats on the lake. We do love our beautiful women in the gallery. I believe this winter's project on her will be to alter her "racing" mentality and mature her into a comfortable daysailer with new seats and most needed beverage holders...She might even change her color from Navy Blue to a brilliant Yellow...Would that make her a blonde?